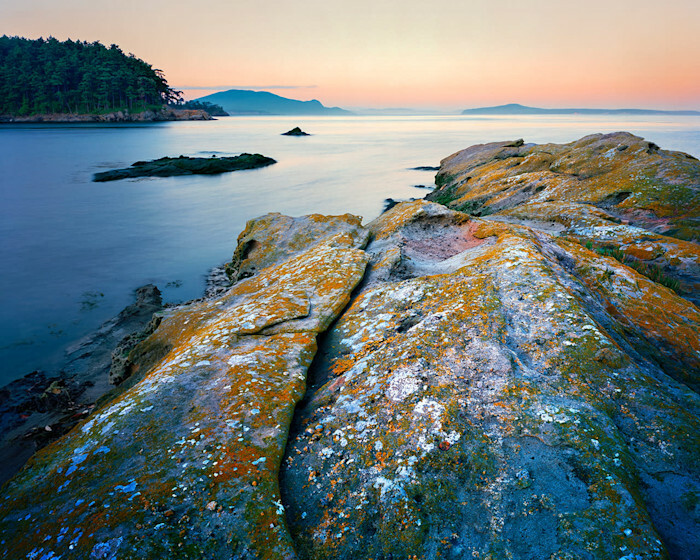 This image was captured at Shallow Bay on Sucia Island. This is a time exposure to show motion of water entering bay on flood tide with the lichen covered rocks. Here the foreground rocks vaguely reminds me of a whale's back. Since 1993 my wife Bev and I have been exploring the San Juan Islands by boat. We now have a 23 ft. boat we can anchor in some really astonishing places on the water. This entry is from Shallow Bay on Sucia Island. There is a small opening (in the middle of this photograph) to this anchorage that is exposed to westerly winds. It's really tempting to anchor near the entrance, to take advantage of witnessing a eye popping sunset as the sun sinks below the distant horizon. If the westerly wind comes up in the night, your sleep might just be interrupted by a rocking boat, halyards banging on masts, dragging anchors and people yelling in the dark. Anchor here carefully.